Perhaps no writer has better articulated our relationship to the environment than Peter Matthiessen. From Wildlife in America to Men's Lives, his work has captured the wonder of the natural world--and the horrors of resource exploitation, with its violent effects on traditional peoples and the poor. In The Peter Matthiessen Reader, editor McKay Jenkins presents a single-volume collection of this distinguished author's nonfiction. Here are essays and excerpts that highlight the spiritual, literary, and political daring so crucial to Matthiessen's vision. Matthiessen chronicles his 250-mile trek across the Himalaya to the Tibetan Plateau in a selection from the National Book Award winner The Snow Leopard. Wild peoples, wilderness, and wildlife--common themes throughout Matthiessen's oeuvre--are examined with grace and power in The Tree Where Man Was Born. Here too are excerpts from Indian Country and In the Spirit of Crazy Horse, Matthiessen's stunning exposé of the Leonard Peltier case and the ongoing conflict between the U.S. government and the American Indian Movement. 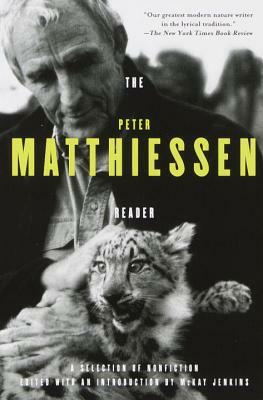 Comprehensive and engrossing, The Peter Matthiessen Reader celebrates an American voice unequaled in its commitment to literature's noblest aspiration: to challenge us to perceive our world--as well as ourselves--truthfully and clearly. Peter Matthiessen lives in Sagaponack, New York. McKay Jenkins teaches literature and nonfiction writing at the University of Delaware.